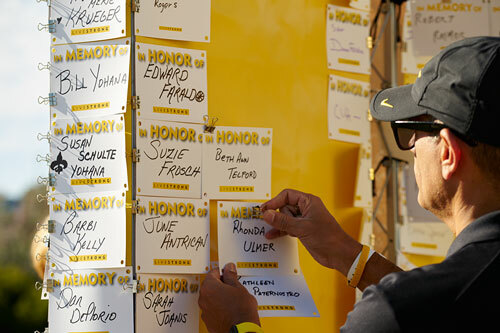 Making a donation to LIVESTRONG is a meaningful way to honor or to remember someone special. Your gift reflects your desire to make a lasting impact on the lives of others, just as your honoree has done for you. Whether you establish a named endowed fund, make an individual gift or purchase a tribute tile in honor or memory of that special someone, your contribution will make a difference. Make a donation of $500 or more and get a custom tribute tile to hang on the walls at LIVESTRONG or for your home or office. 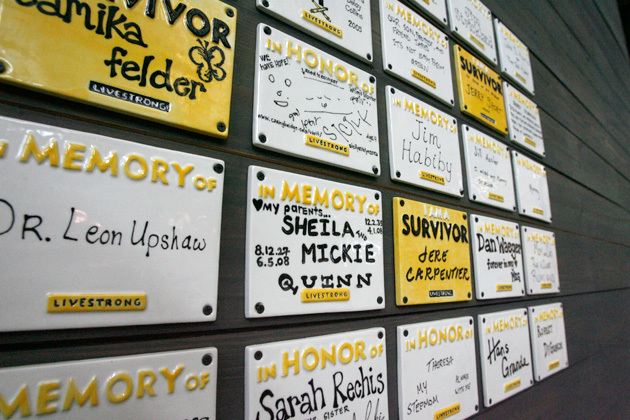 Make a permanent tribute in honor or memory of a loved one, or celebrate your own survivorship with a personal tribute tile to be displayed at LIVESTRONG. You design your tribute with words or images of your choice, and an artist will render your work onto your tile. You can choose to make an In Honor, In Memory or a Survivor permanent tribute tile. Additional tiles can be ordered for your home or office, or to share as a gift, but only 400 will be created for permanent display at the LIVESTRONG headquarters. So order now! Our programmatic mission is invaluably funded in part by each endowment fund. Every gift to LIVESTRONG represents a personal connection and a compelling story, and we are deeply grateful for these gifts, connections, and stories that affirm the value of what we do. 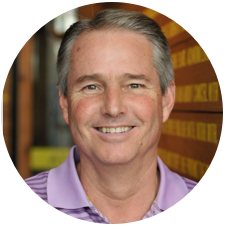 LIVESTRONG utilizes a sound investment strategy to manage its endowment which is overseen by a seasoned corps of leading investment professionals. This strategy has both optimized the growth of the endowment while also providing a stable source of income to support current operations. In order to meet today's needs while protecting tomorrow's resources, the LIVESTRONG Finance Committee maintains an investment policy using the "prudent person" standard to make both investment and spending decisions. Contact us about setting up an endowment.